I loved this song and it stuck with me for months. The beat, the sound, the voice… it was all there. I wanted to hear more. But it would be a good 6 months more before we heard anything else new by Duran Duran. The wait was well worth it. 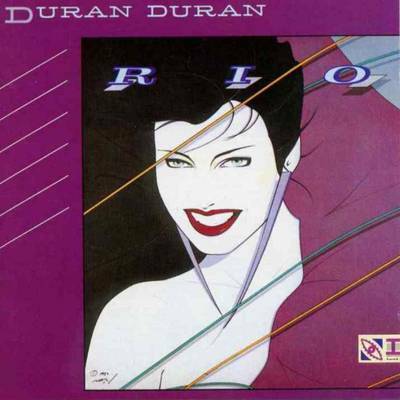 Released in May in 1982, “Rio” hit the charts running. Eventually topping out at double platinum, Rio would be forever known for it’s 80’s sound, not to mention inspiring a slew of other bands [The Killers, Franz Ferdinand] and several related side projects [Arcadia, Power Station] that kept the New Romantic sound flourish. Over the years, there’s been some line up changes, hiatuses, a reunion and several not-so-monumental musical movements. And through it all, I’m still a big Duran Duran fan. But Rio still stands as that moment that cemented my status as a fan. It’s such a great album. Still a favorite of mine as well… though I was a huge fan since the minute I got my hands on their self-titled debut. What’s not to like about this great band and their first 2 albums. I’ve also always been a fan. In high school there was a guy who dressed & did his hair like Nick Rhodes, and I thought he was the hottest guy ever. Ahhh, the memories! Seems you were not the only one that loved Nick Rhodes. My ex-wife did, as many other girls I knew. One of my all time favorite albums of, er, all time. I’ve owned this on vinyl, cassette, and CD and have played it to death. Hold Back The Rain is my fave song I think. Such a good album. Hold Back The Rain is a great song. Love the whole structure of the song, especially how it ends. I love Duran Duran and always have. Are you really 12 years older than me? Yep. I will be 48 this August. I loved this album! I was (well, am) a rocker chick, so for me Duran Duran was sort of a guilty pleasure. Happy to out myself as a fan these days of course. I loved Nagel artwork, which makes this for me one of the most iconic and recognizable album covers of all time. The album cover is very iconic. Nagel art has always impressed me as well. And nice that you can now “come out” and be a fan. Hey Marty – thanx for the vote over on my blog. I didn’t mention this in the entry, but when The Reflex came out, I rode my bike across Lake Charles, LA (probably 5 miles?) to buy the 45 record. When I told this to my (now) wife when we were 15, it got me a lot of respect in her eyes. Maybe that’s one reason we’re still together. I also wrote about Duran Duran some time ago and all the “firsts” they had as a band. Hoping your wife wins. I did spread the word here on my side and know of a few votes from others. Thanks for the link to your post. I’m surprised I didn’t see it before now (since the date of the post was very close to TequilaCon 09).